Quite a lot of people heard “Calon Lân” for the first time in this way when it was performed on the TV show “Britain’s Got Talent” in 2012, by a choir of young Welsh lads known as “Only Boys Aloud.” It was one of those obviously choreographed but still likeable moments when people are unexpectedly wowed. The video is embedded via YouTube below (and then below that some more scribbling from me about the song). The boys got to the final, where they were defeated by a dancing dog. No shame in that; we humans have little choice but to concede that dogs are our betters. 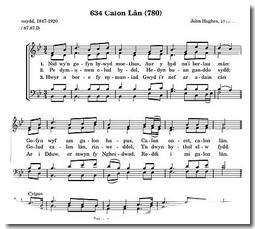 The first time I heard “Calon Lân” I was very interested indeed to know what the words meant, so I looked it up. Canu’r dydd a chanu’r nos. Sing in the day and sing in the night. 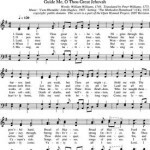 There was a certain kind of synchronicity for yours truly in becoming familiar with this song, as I was also participating in a little Bible study on the Sermon on the Mount at the time. Though there’s an incalculable amount that can be said about that preaching of Jesus, a central theme surely is that Jesus is asking people to look to and examine their hearts; he is challenging people to have hearts that are worthy of lifting up to God. This song constitutes a poignant prayer for God’s help in that very quest. It also strikes me as a particularly resonant prayer in such times as those in which we now live, with a great excess of everything assaulting us: the twenty-four-hour-media, all but inescapable on screens from a couple of inches wide to ones that take up the whole wall, accompanying us from the bathroom to the bank, telling us all the things we want, all the things we ought to desire if we don’t already, and all the things we don’t need to know about everyone else. And all of these things are working so efficiently to crowd out any simplicity—and certainly any sense of the holy and the pure—remaining in our hearts. There are lots of versions of “Calon Lân,” once you look for them. 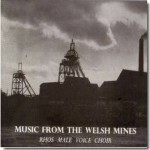 Although I love the male voice choirs, my favorite most days is the simplest version out there, just voice and guitar by a great modern-day ambassador of Welsh music, Cerys Matthews. On YouTube there is also an earlier live performance from her with harp and banjo, and a lovely version with the Fron Male Voice Choir and string accompaniment, but this simplest one embedded below is from her marvelous 2010 album, TIR (which means “land”). An old joke, I believe, is that God answers prayers recited in Welsh twice as fast … there being no need to translate them. (Actually, given what’s known of some significant connections between the Welsh and Hebrew languages, there might be something in that joke.) 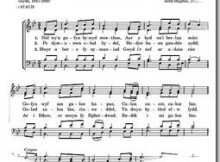 In any case, it’s my belief that a song that is so deeply expressive even to those who don’t know its language must surely rise quickly to God’s own ear and be treasured there.